A wealthy but childless Roman couple, John and his wife decided to leave their fortune to the Church. The Virgin appeared to them on the night of August 4th and told them that she wished a basilica to be constructed on the Esquiline Hill which would be outlined in snow. Pope Liberius also received the same message from the Virgin and ordered the construction of St. Mary Major Basilica. Pope Liberius succeeds Pope Julius I as Bishop of Rome. 352 thorugh Sept. 24, 366) also received the same message from the Virgin. The next morning John and his wife and Pope Liberius went to the top of the Equiline Hill which had been covered with snow. After they measured out the area for the basilica, the snow disappeared. Pope Liberius immediately called for the construction of the Basilica. St. Mary Major (Santa Maria Maggiore) was completed. Santa Maria Maggiore as we see it today took shape, when Pope Sixtus III (432-40) decided to build a new and more magnificent structure near (if not on) the site of Liberius' former Marian church. The altar is alleged to contain the relics of the manger crib of Jesus, which was brought back from Jerusalem with the True Cross by St. Helena. An image of Our Lady of the Snows is a painting of the Madonna and Child, attributed to the physician-Evangelist, St. Luke. Also, in this sanctuary reside relics of many of the apostles and saints, the body of St. Matthew, and the head of St. Luke. As a result, pilgrims from all areas of the world have made this one of their most important churches. Compartments of the intricate ceiling were fashioned with the first gold brought from the Americas by Christopher Columbus. Pope Sixtus III celebrated the dedication of St. Maria Maggiore. St. Gregory the Great made special devotion to Our Lady during the black plague in Rome and had her image carried in procession from St. Mary Major to St. Peter's Basilica. The apparition of St. Michael appeared in the sky to indicate the end of the Plague. The miracle was first recorded in writing by Fra Bartolomeo of Trento. "Coronation of the Virgin," executed by the Franciscan monk Giacomo Torriti, then became the aesthetic focal point of the entire basilica. project, carried out by Domenica Fontana, the basilica was to be the center of a radial series of streets, extending like the points of a star to connect with Rome's most important sacred sites. An obelisk, removed by Fontana from Augustus' mauseleum on the orders of Sixtus V, was erected to the rear of the basilica's apse, and marks the focal point of this ambitious urbanistic vision. Sixtus also removed the earlier reproduction of the sacred manger to an elegant crypt beneath his own side chapel. Across from Sixtus V's chapel, Pope Paul V built his own chapel to house an earlier icon of the Madonna with child. basilica's exterior, the architect managed to offset some of the incongruity of styles by enclosing thirteenth century mosaics, including a rendition of the miraculous snowfall. This mosaic, along with the bronze statue of the Virgin and Child on top of the 15 meter-high column (erected by Paul V in 1614) dominate the square before the church. There is no official approval for this apparition. Pope Liberius ordered the construction of St. Mary Major in 358 after witnessing the outline of miraculous snow on Esquiline Hill. The Feast of the Our Lady of the Snows is celebrated on August 5th. Locals drop white rose petals from the dome during the feast mass. White jasmine is used to symbolize the purity and innocence of the Blessed Virgin. 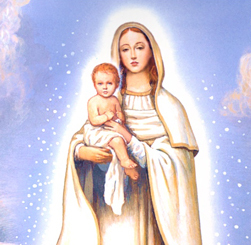 Our Lady of the Snows, Immaculate Queen of the Universe, from this privileged sanctuary, Thou has bestowed so many countless graces and pledges of love upon the hearts and souls of millions. O Mother, from this cradle of Christianity, this Mother Church of all churches, deign to shower forth the graces of thine Immaculate Heart upon the remnant Faithful throughout the world, wherever they may be, and grant them the graces of a childlike love and unwavering fidelity to the holy truths of our Faith. Grant, good Mother, to the faithful Bishops of the Church the grace to defend Her Sacred Teachings, and to persevere courageously against all the enemies of the Holy Church.